We’d love your help. Let us know what’s wrong with this preview of Can't Make This Stuff Up! by Susannah B. Lewis. Millions of online fans have flocked to Susannah B. Lewis's hysterical, take-no-prisoners videos that capture her uproarious yet deeply faithful view of the world. Now In her highly-anticipated nonfiction debut, humorist and popular blogger Susannah B. Lewis (Whoa! Susannah) uses dry wit and an eye for the absurd to find laughter in even the most challenging circumstances. To ask other readers questions about Can't Make This Stuff Up!, please sign up. If you haven't ordered the book Can't Make This Stuff Up! You are missing out! Susannah B. Lewis aka Whoa Susannah you are an amazing writer!! God Bless your little hands that write these wonderful books. You REALLY Can't make this stuff up!! I can't wait to buy and send to family and friends. How soon will this book be available for multiple purchases?? FAIR DISCLOSURE: I received an ARC (Advanced Release Copy) of this book. "Can't Make This Stuff Up! : Finding the Upside to Life's Downs" was my introduction to Susannah B. Lewis although she is a blogger and has done podcasts. Her Southern roots and her love for her family shine through the book. Some of the book hit me hard, because she talks a lot about the death of her mother, and I lost my Mom in June of this year. She has a sense of humor--sometimes sassy, sometimes sweet. She is brutally ho FAIR DISCLOSURE: I received an ARC (Advanced Release Copy) of this book. I received a preview copy of this book to review. I have followed Susannah since her blogging days, and have howled with laughter at her Facebook videos (some of them still make me giggle as I recall them--those PSAs crack me up). I cried with her when she recounted losing her mom, and cried tears of joy last year as she announced her pregnancy. She is so down to earth and relatable, and because I feel like I know her, when I had the opportunity to read the first few chapters of her newest book, I received a preview copy of this book to review. I have followed Susannah since her blogging days, and have howled with laughter at her Facebook videos (some of them still make me giggle as I recall them--those PSAs crack me up). I cried with her when she recounted losing her mom, and cried tears of joy last year as she announced her pregnancy. She is so down to earth and relatable, and because I feel like I know her, when I had the opportunity to read the first few chapters of her newest book, I jumped at the chance. I read it in one sitting. I found it to be an easy read, and I loved how she tied Scripture into each chapter. Doing so helps her reader understand her point of view. As a Christian, she does not pretend to be perfect or have a better life than anyone else. I appreciated her honesty in sharing her struggles in her marriage and the way addiction has affected her life. The publisher was kind enough to provide me with the first eight chapters of this book, and my review is based on those first eight chapters. After reading them, let me tell you, April 9 CANNOT GET HERE FAST ENOUGH so that I can get the entire book (which I have pre-ordered) in my hot little hands. Susannah B. Lewis is a Southern girl, as am I. That makes me love her right off the bat. She's from a small town. She has lost both her parents. She's a mom. I can relate to all these things. And she t The publisher was kind enough to provide me with the first eight chapters of this book, and my review is based on those first eight chapters. After reading them, let me tell you, April 9 CANNOT GET HERE FAST ENOUGH so that I can get the entire book (which I have pre-ordered) in my hot little hands. Susannah B. Lewis is a Southern girl, as am I. That makes me love her right off the bat. She's from a small town. She has lost both her parents. She's a mom. I can relate to all these things. And she throws down some serious truth in these first eight chapters, and does it in a way that will make you laugh and cry (and maybe laugh and cry at the same time) and want to reach into the book and give her a big ol' hug. She writes about her life and the truths she's learned in the living of it. She shares glimpses into her past and present and weaves in Scriptural truth. You don't even have to be Southern, or a mom, or from a small town, to appreciate it. The truths found here are universal. Do yourself a favor. Just go pre-order the book, because you won't want to wait one second longer than you absolutely have to to read the whole thing. And then you'll want to read it again. Trust me on this one. I liked the stories of her life but I am not a religious person so I had to skip the Bible quotes because they were a bit much for me. I enjoyed how this author uses her faith to get through life. When she faces problems, she looks to the Bible for guiding words. She is very honest about her life and her stories will make you laugh. I received this book as a Goodreads giveaway. Yay! If you haven't seen one of "Whoa Susannah's" videos, you have been missing out. I first came across her hilariousness on Facebook and was an instant fan. So when I heard that she was writing a book, I was so excited! I had such high hopes for this book, and let me tell you, this book exceeded my expectations. It is everything I thought it would be and more! I laughed and I cried and I followed Susannah's advice and "cried until I laughed." This book is so funny, but also so meaningful. I felt li If you haven't seen one of "Whoa Susannah's" videos, you have been missing out. I first came across her hilariousness on Facebook and was an instant fan. So when I heard that she was writing a book, I was so excited! I had such high hopes for this book, and let me tell you, this book exceeded my expectations. It is everything I thought it would be and more! I laughed and I cried and I followed Susannah's advice and "cried until I laughed." This book is so funny, but also so meaningful. I felt like I could just hear Susannah's voice telling these stories as I read. I would love to have an audio book of her reading this! Susannah has such a way with words and such a wonderful outlook on life. She is open and real, and did I mention hilarious?? I absolutely loved hearing about Susannah's life, especially her sweet relationship with her mother. Her stories are so vivid and descriptive that it makes you feel like you are experiencing them as well. I also love that Susannah's favorite story to tell is the one about how God gave His only son to save us and there is nothing we can do to change the greatness of His love for us! FAIR DISCLOSURE: I received an ARC (Advanced Release Copy) of this book-- the first 8 chapters anyway. Now I'm jonesing for the the rest. So much so, that even though I have pre-ordered on Amazon, I may have to get a few more copies and hand them out to friends. If you are Anti-Christian, look down your nose at Christianity, or have no heart -- you will not like this book. It's filled with life experiences, and the scriptures that got her through. If you are on the fence with Christianity, this wil FAIR DISCLOSURE: I received an ARC (Advanced Release Copy) of this book-- the first 8 chapters anyway. If you are on the fence with Christianity, this will bring you closer to God and restore your faith a little bit, not to mention bring you some comfort if you are grieving. If you are a religious Christian, you will be shouting "Amen" from every church pew, every street corner, every rooftop you can find. This isn't "a" story -- it's a collection of short stories, wonderfully woven, detailed stories-- some of them so much like my own, I feel Susannah and I may have been sisters in another life. This is an easy read. So wonderfully entertaining. I laughed, I cried.. and just in the first 8 chapters. I received this book from Goodreads and Nelson Books for the ARC in the giveaways. I am so grateful I did. I didn’t know anything about Susannah B. Lewis prior to receiving this book. This book really lets you get to know who she is from a very honest but best best girlfriends kind of way. This book was such an easy read, wasn’t hard to get into and stay interested. Many funny moments and just an all around feel good book. I found that I was quite entertained by her memories and what she was goin I received this book from Goodreads and Nelson Books for the ARC in the giveaways. I am so grateful I did. I didn’t know anything about Susannah B. Lewis prior to receiving this book. This book really lets you get to know who she is from a very honest but best best girlfriends kind of way. This book was such an easy read, wasn’t hard to get into and stay interested. Many funny moments and just an all around feel good book. I found that I was quite entertained by her memories and what she was going through in each chapter. It was helpful to me to read about her losing her mother and how she dealt with it. I lost my mother just a few years ago as well and it made me pause to see how God had used my everyday life to move me through my own grief. I enjoyed the splattering of scriptures. I didn’t find the book to come across preachy and too many scriptures. I would say it was just about right. I preordered a copy and was sent a chapter to read. Excellent book. Really kept me thinking and some stories brought tears to my eyes. Loved it. Thank you to Good Reads and the Author for letting it be given away. Amazing author.. very funny and will have you wanting MORE!!!! You will cry and even laugh out loud. It will make you take a good hard look at what you have and make you cherish it. I can relate to most of the real-life scenarios that Susannah B. Lewis cleverly describes. However, the total takeover of Biblical quotes, alienated me as someone who doesn't practice. It took away from my pleasure when reading the book. I received a sample copy of this book that included the first 8 chapters for my honest review. Susannah Lewis delivers you a genuine story about navigating life. You experience her joys and tragedies with her, she writes in such a compelling and heartfelt way that you can't help but feel what she is feeling. She mixes in a bit of humor which is the type of storytelling that I was used to from her. You can feel the pain and joy in her writing. Susannah is a follower of God and you go through her I received a sample copy of this book that included the first 8 chapters for my honest review. If you enjoy a good conversation of reminiscing with a friend, a friend from small town southern USA, then you will enjoy the smiles, the laughs and even the tears as Susannah shares her life stories. Infused with scripture and Biblical truths you will see the path she has chosen and how she stays on that path today. I anxiously await the rest of her story! I was fortunate enough to receive an advanced copy of this book. Can't Make This Stuff Up! By Susannah B. Lewis, and this book is my favorite read so far this year! I loved her as a blogger, but goodness Susannah is funny, relatable, and quite possibly my new favorite author. As a southerner myself, I especially loved reading about her testimony and her walk with Christ, even when it was difficult. She made me laugh, cry, and reminisce about my formable years. I recommend this book for anyone who I was fortunate enough to receive an advanced copy of this book. Can't Make This Stuff Up! By Susannah B. Lewis, and this book is my favorite read so far this year! I loved her as a blogger, but goodness Susannah is funny, relatable, and quite possibly my new favorite author. I received an advanced sampler of this book with the first 8 chapters. I love that Susannah is so real about events in her life and how her faith has brought her through some tough times. Her book is easy to relate to and full of encouraging messages. I would recommend this book to anyone looking for a laugh and needs encouragement to find the positives in life when life is bringing you down. I have watched her videos on Facebook for some time now and she always manages to make me laugh. For this book, I love how she incorporated humor with her messages about Christianity. I loved this book. I downloaded the Audible version where she reads it herself and I enjoyed every minute of it! I was able to read the first eight chapters of this book. I have read other books by this author that were fiction and I loved them! This book was completely different in content and I loved it even more! She is so real and has wonderful insight on how to use scripture and faith to get through this life. It will make you laugh....it will make you cry. It will certainly make you think. Great read! I was blessed to be chosen as a reviewer for this book. I was sent a sample of the book including the first 8 chapters. I am in school so finding time to read for pleasure is difficult. I picked this book up this morning and could not stop until I finished it. The author Susannah is incredibly funny. She is also religious. I thoroughly enjoyed her religious and humorous spin on her life, even through some tough tribulations, through god, she found "the upside to life's downs". It might be just t I was blessed to be chosen as a reviewer for this book. I was sent a sample of the book including the first 8 chapters. I am in school so finding time to read for pleasure is difficult. I picked this book up this morning and could not stop until I finished it. I will definitely be reading this one again and again through the years! Susannah B. Lewis is the author of Ten Years Taken, The Charm of the Defeated, Suspicion on Sugar Creek and Unfortunate Ursula Underwood. 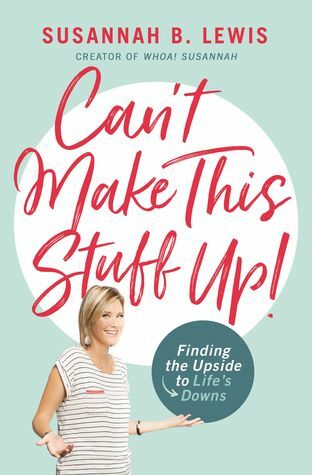 Her first non-fiction book, Can’t Make this Stuff Up, will be released by Thomas Nelson in April 2019. Susannah’s work has been featured on Yahoo!, Lifetime, TODAY, US Weekly, Southern Writers’ Magazine, The Humor Daily and Erma Bombeck’s Humor Writers, among ot Susannah B. Lewis is the author of Ten Years Taken, The Charm of the Defeated, Suspicion on Sugar Creek and Unfortunate Ursula Underwood. Her first non-fiction book, Can’t Make this Stuff Up, will be released by Thomas Nelson in April 2019. Susannah’s work has been featured on Yahoo!, Lifetime, TODAY, US Weekly, Southern Writers’ Magazine, The Humor Daily and Erma Bombeck’s Humor Writers, among others, and she has over 2 million followers on social media. She is also the recipient of Blogher’s Voices of the Year Award for her work in literary non-fiction. Susannah lives in Tennessee with her husband, Jason, two children and four dogs.